During a recent phone interview covering the Spectre press tour, ComicBook.com spoke with actor Dave Bautista, who plays Hinx, a henchman in the vein of Oddjob and Jaws, in the newest Bond film. 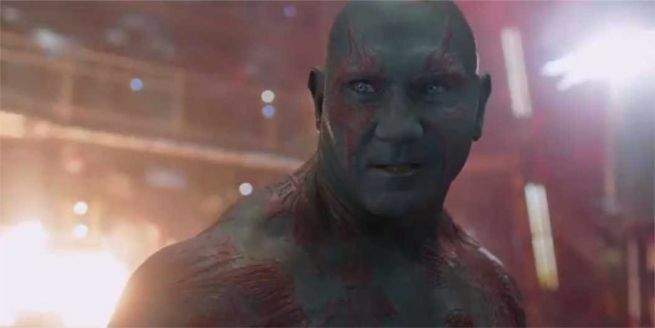 We'll have plenty from him on that film later, but of course, being ComicBook.com, we also spoke to him about Guardians of the Galaxy Volume 2, which will start shooting soon at Pinewood Studios Atlanta. "I actually already went in for a visit to Pinewood Studio," the actor told us, "did some screen tests and make-up tests. The process has already started!" He was clearly enthused the moment the film was brought up, and said that he's trying really hard not to know too much about it until they're ready to shoot. "I’m super excited. They’re in the second draft of the script, and I was offered that, but I said 'No, I don’t want it until it’s ready to go!'" he said. He admitted part of it was not wanting "the pressure of possibly saying something and giving something away" with a laugh, but said it's also just about him loving the material so much. "To be honest with you, when I read the script of Guardians, it almost put a damper on it. First and foremost, I’m a fan, and the second I know what’s going to happen it kind of takes away from the magic a little bit!" Bautista said. That's why he hasn't asked writer/director James Gunn anything about the movie, including the big mystery of who Star-Lord's father will be in the Marvel Cinematic Universe. "I honestly think that if I asked James, he would tell me, but I haven’t asked him. I always think that if they’re not telling you, there’s a reason they’re not telling you. So I almost don’t want to know, because I want to be surprised! I’ll probably know before the finished product, obviously, though." He did mention that while he didn't want to know from being told, "that doesn't mean I'm not curious!" As for what he thinks Gunn is going to do with the film, he has every confidence. "I know this is going to be great. James [Gunn] is very excited about this film. To see him be soamped up, you really get that feeling that it’s going to be something special," he said. He went on, talking about the pressureGunn has at following-up a hit. "When I asked him before, coming off the success of Guardians of the Galaxy, I knew the pressure was on him to make it better, and I asked him, 'How are you going to top this? How are you going to make it better?' He said, 'No, I’m going to make it different.'" Ultimately, Bautista is ready to get started, and is "really excited about this film." One thing he's a little worried about is that make-up process. When I told him I hoped it'd be a bit faster for him this time around, he laughed a great big belly laugh saying, "Yeah, me too. You have no idea." Spectre hits theaters in North America November 6, 2015. Guardians of the Galaxy volume 2 is scheduled for a May 5, 2017 release.